Maxs Clean Mass 2.72 kg – This is a Lean Gainer containing and a higher concentration of Protein than the Maxs Absolute Mass. 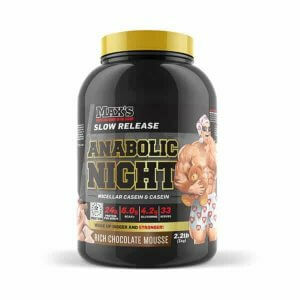 Maxs Anabolic Night 1.82kg – This is a Slower digesting protein containing Casein which allows you to feed the muscle smaller amounts of Amino Acids over a longer period of time, for example, if you consumed this before going to bed. FREE Maxs Lab Series Creatine X8 – Maxs Creatine X8 is a mix of 8 different types of creatine which allow and higher percentage uptake of Creatine to the Anaerobic system helping generate more power and strength in your workout.